Thomas Hardy is one of the World’s greatest and best-known authors. And possibly Dorset’s most famous son. By the time of his death in 1928 he lived on the outskirts of Dorchester in a substantial house of his own design at Max Gate. But he was born here, in 1840, at Higher Bockhampton, in a thatched cottage built by his Great Grandfather. In this tiny cottage, embedded in woods on the edge of what he called Egdon Heath, Hardy was born and lived much of his early life. He wrote his first two novels here; Under the Greenwood Treeand Far from the Madding Crowd. And he weaves much of the places and people that surrounded him into his work. Any Hardy fan who visits his Higher Bockhampton home, will recognise instantly the places and scenes from which the author drew inspiration. 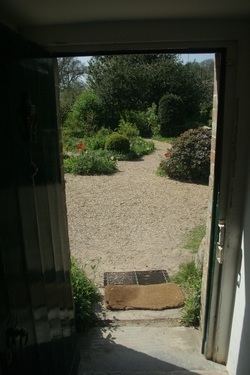 But even those who aren’t familiar with his work are likely to find the cottage and surrounding countryside inspiring. Hardy’s writings draw heavily from what he saw around him, from the landscapes he described so richly to the lives and stories of those he met or heard about as he grew up and worked in rural Dorset. Even today “Hardy’s Cottage” is beautifully secluded and peaceful, making it easy for the visitor to picture the great man sitting at a window looking out over the scenery that was to make him fame and fortune and that in turn he would make famous. While not quite a rags to riches tale, it is clear on visiting Hardy’s Cottage that the Hardy family weren’t wealthy when Thomas was young. The cottage is small and simple, as many in the area were and still are. Compared to the various manors and other big houses in Dorset, it’s obvious that the landed and the lowly lived very different lives then, as now. Different again to the houses and lives of the people who lived in nearby Dorchester, the town Hardy would describe as “Casterbridge”. These themes of landscape and the divided yet intermingling lives of people from different sections of society were the common thread through much of Hardy’s work -certainly the best of it. “Tess of the D’Urbevilles”, “Far from the Madding Crowd”, “The Mayor of Casterbridge”, “Return of the Native”, “Jude the Obscure” to name but a few all explore aspects of the lives and relationships of people moving up, down or out of the structures and circumstances thrust upon them by the society of their day. 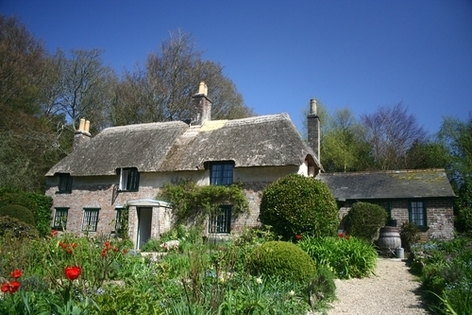 And always, the backdrop to the main events and action of the tale the character, beauty and, at times, harshness of “Hardy’s Wessex”, with Dorchester and Dorset at its heart. To modern readers, Hardy’s preoccupation with landscape may seem a little strange. But modern forms of transport do much to protect travellers from the environments through which they speed. Hardy’s world and the world of many of his impoverished characters was not one that sped past at 60 miles per hour, but one through which people walked (or sometimes rode) at 5 miles per hour, making every pace taken a joy or a hardship depending on the weather, the terrain and the condition of the walker. Small wonder then that journeys on foot are often key events or the causes of them in the works of Thomas Hardy. In our Twittering, Facebooking, instant snapshot of nothing modern world, undoubtedly some will find the more pedestrian pace and style of Hardy’s novels a touch slow. But allow yourself to relax, slow down and go with Hardy’s flow and the rise and fall of the landscape and his tales bring rewards that are rich and lasting. 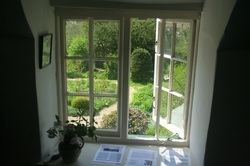 Visiting Hardy’s birthplace at Higher Bockhampton, you can not only visit his home, but you can also walk the places he walked. See the everyday places he saw and be part of the landscapes he described. Whilst younger kids may not get much out of Hardy’s Cottage itself, except perhaps that it is very pretty. There are extensive walks through Thorncombe Woods and then out into Puddletown Forest beyond. These take in a good mix of short and longer walks through a mix of deciduous and evergreen woods as well as Hardy’s beloved heath. The walks provide ample opportunity for young or old to get fresh air exercise and to enjoy a wealth of wildlife for the careful spotter. There are also riverside walks along the River Frome at Lower Bockhampton just down the road. These lead to Stinsford Church, where the great writer’s heart is buried. His ashes having been buried in “Poets Corner” in Westminster Abbey, contrary to his own wishes - but that’s another story. Or perhaps it is the key to all the other stories. If Hardy’s life and works show one thing, it is that talent and hard work can take you from the humblest of cottages in the country to being laid to rest with the great and the good in the nation’s capital. The danger is, that in doing so, there’s a risk of losing your heart! In one sense Hardy achieved what many of his characters didn’t. He broke through some of the barriers society imposed upon him and others he imposed upon himself, but certainly during his lifetime, there were limits he tried to push too far for some. The themes he explored in his last two novels, which many now consider to be his best and most insightful, were deemed by others of his time to be scandalous. It was society’s response to those works that led Hardy to stop writing novels and devote the rest of his years to poetry. Tess of the D’Urbevilles and Jude the Obscure both deal with the impacts and expectations of society on women and the tragedies visited on individuals as a consequence. Both stories have since been made into films and onto TV as have several other Hardy works. For this we must all be thankful, partly because it keeps the greatness of Hardy’s work alive, but also because it retains the link between the beauty Hardy saw and wrote about and the beauty of Dorset as it is now. Many of the “fictional” places Hardy saw, walked and described are still there for all to see. Whether you’re a fan of Hardy, of great landscapes or both, a visit to the place it all began is well-worth the effort. Entry to Hardy’s Cottage does attract a small fee unless you’re a National Trust member, but Thorncombe Woods and other walks are free! 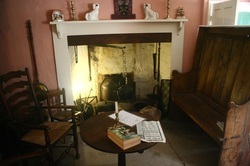 So, Hardy’s Cottage - a must for Thomas Hardy devotees and a great place for those who could be! In this tiny cottage, embedded in woods on the edge of what he called Egdon Heath, Hardy was born and lived much of his early life. 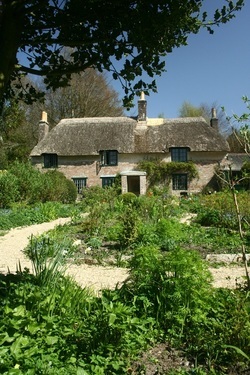 He wrote his first two novels here; Under the Greenwood Tree and Far from the Madding Crowd ...​"